Inside the dock, Morsi and members of his Muslim Brotherhood group chanted, "Down with military rule!" after the judge read out his ruling against him. The judge's request for the death sentence in connection with the jailbreak case was referred to the grand mufti, a high religious cleric, for ratification. However, the mufti's recommendation is not binding. Even if he advises against the death sentence, the judge can still go ahead with it. Hundreds of people have been sentenced to death in a crackdown on the Brotherhood following Morsi's removal in 2013. All death sentences must first be sent to the grand mufti, Egypt's highest religious authority, for his non-binding opinion on whether they should stand. 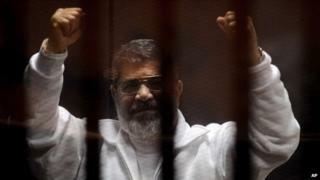 Morsi's supporters have condemned the cases against him as a political show trial. Amr Darrag, a former minister in Morsi's government, described Saturday as "one of the darkest days" in Egypt's history. "These latest charges are another deeply disturbing attempt to permanently erase democracy and the democratic process in Egypt," he said in a statement. Media captionWhat happened to ousted Egyptian president Morsi? The death sentence was also condemned by Amnesty International, which said it had become a tool "to purge the political opposition", and Turkish President Recep Tayyip Erdogan, who likened it to a return to "ancient Egypt". What's become of Egypt's Mohammed Morsi?